The sign reads: Conservate la la setta (keep the sect / conserve the schism) Vale Mezzo Soldo in Premi (worth half a penny in premiums / worth half the money in prizes) Scrive te Per Catalogo aila (write for the catalog at) PARODI FACTORY Jersey City N. J.
Parodi Factory, Jersey City, were Parodi Cigars, Quirino Vicenzo Parodi (1870-ca.1935), proprietor. According to his naturalization petition dated 10 September 1906 Quirino V. Parodi was born in Italy 5 April 1870 and arrived in the U. S. 15 April 1891. He was listed as an importer at 502 West Broadway, New York City, in the New York telephone directory of 1898. The following year he was in business with Marcello Erminio as Parodi, Erminio & Co., importers, at 504 West Broadway. His partner, Marcello Maria Erminio (1873-1921), was born in Genova, Italy, 27 April 1873 and immigrated in 1896. He died while traveling in Genova 18 July 1921, and was buried 23 August 1921 in Holy Cross Cemetery, Brooklyn. Attached to Marcello Erminio's passport application in 1921 was a letter with this letterhead for Parodi, Erminio & Co., 534-36-38 West Broadway. The import-export business, Parodi, Erminio & Co., was in business in New York until the mid-1940s. 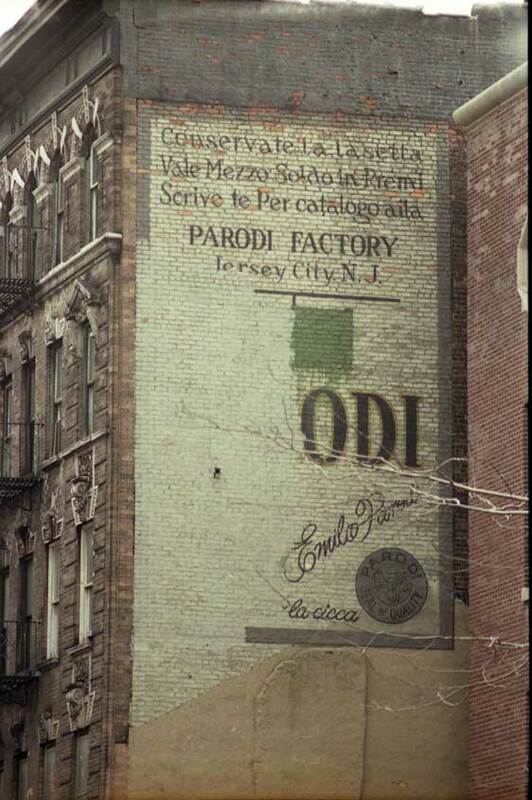 The Parodi Cigar Co. was incorporated in 1915 when they were located in West Hoboken, New Jersey. In 1917 they were listed at 223 Bleecker St. in New York City. The Parodi Seal of Perfection trademark was registered 17 October 1916 after a filing date 27 December 1915. The registrant was Parodi Cigar Company, 26 Cornelison Avenue, Jersey City, NJ. From 1918 through 1925 they were listed in Jersey City, New Jersey, city directories at 26-38 Cornelison Avenue, Jersey City. In addition to Parodi, a member of the firm was Parodi's father-in-law, Giovanni Luzzatto (1852-1939). In 1929 the New York telephone directory listing for Parodi Cigar changed to Parodi Cigar Co. of N. Y. Inc. This probably reflects Parodi's sale of the company around that time. In 1930 the business, no longer controlled by Parodi, opened a manufacturing plant in Scranton, Pennsylvania. As reported in The Scranton Republican (Scranton, Pennsylvania) 11 Jan. 1930, pg. 13, "Another new industry secured by the Chamber of Commerce for Scranton, the Parodi Cigar company, of New York City, has leased 6,000 square feet of floor space in the building at 481 North Main avenue, and plans to start operations on or about Feb. 1 with an initial force of fifty employes. Comprising the concern are three brothers, A. D. and F. Suraci, who have engaged in the manufacture of cigars, particularly for the Italian trade, over a period of many years. They have also acted as jobbers for tobacco leaf. ..."
In 1942 the New York Times reported, "The Parodi Cigar Company of New York, Inc., with general offices and main plant at Scranton, Pa., bought the building at northwest corner of Provost and Fifteenth Streets, Jersey City, N. J., at the exit of the Holland Tunnel. The sale was made by the Joseph J. Garibaldi Agency for the New Jersey Title Guarantee and Trust Company, in liquidation, and was approved by the court." In 1945 the New York Times reported, "The three-story factory building at 26-38 Cornelison Avenue, Jersey City, N. J., owned by the Parodi Cigar Company will be offered at auction by Fred Berger & Co., at 2:30 P. M. next Tuesday in the South Room of the Hotel Commodore. ..."
The following was posted 23 Oct. 2014 by Alan Luzzatto on ancestry.com, "Querino Parodi was married to my Great Aunt Emily who was Joseph Luzzatto's sister. He was 9 years older than she and came from Italy. He became a naturalized U.S. citizen in 1906. He was the President of Parodi Cigar Co., on 86 Cornelison Street in Jersey City as noted in a 1925 publication. I found that he had traveled on a ship in 1927 and thereafter I have found no info. The picture that we have of him comes from an early photo album. Emily was noted to be a widow on one of her ship passages and her death was confirmed in 1937 in Gibralter where she is buried. Querino owned the Parodi Cigar Factory until 1925 when he sold the business to Anthony and Frank Suraci of the State Leaf Co. an Italian competitor. The business is currently called Avanti Cigars and one of their premier cigars is still called the Parodi Cigar and it is still sold in 2014." A photo of a delivery wagon marked Parodi, Erminio & Co. is available online in a google book, Little Italy, by Dr. Emelise Aleandri. The accompanying text explains, "Quirino Vincenzo Parodi and Marcello Erminio were partners in an import-export business at 504 West Broadway. Erminio's father, Alessandro, owned an import business in Genoa and sent his son to New York in connection with it. ..." This page also includes an ad for Lucca "sublime" Olive Oil. Also, one could very well ask why the sign was painted on a wall in this stretch of East 6th Street. Seems an odd location. And what is "Conservate la la setta" all about? Also, the signature reading Emilio Parodi is a mystery. Who was Emilio Parodi? There does not seem to be anybody of that name in the immediate Parodi family. There are enough questions here to suspect the sign may be a fake, painted to serve as a backdrop for a film shoot maybe.